With multiple entities vying for one of the three resort casino licenses that will be handed out in Massachusetts the Massachusetts Gaming Commission is now looking over all of the proposals that have been submitted, including three potential sites for a casino in the Greater Boston area. 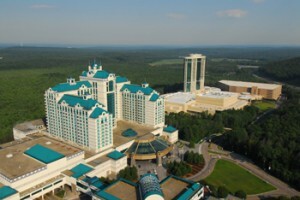 One of these proposed sites, in Milford, is a $1 billion, 300,000 square foot mega-casino now under the control of Foxwoods, dubbed Foxwoods Massachusetts –obviously the Foxwoods marketing department has been downsized recently considering their choice of such an inventive brand name. On Monday, Foxwoods representative Scott Butera, the CEO of Foxwoods Resort, addressed the town selectmen and a large group of residents regarding the proposed site. Among the concerns raised by selectmen were logistical issues such as traffic and sewer problems, Foxwoods’ recent financial issues, the criticism that casino jobs are “low-paying” jobs. Selectman William Buckley called it “the elephant in the room”, the recent cease and desist order issued by Foxwoods to the projects founding partner, developer David Nunes. The other proposed sites for the Greater Boston area Casino are Suffolk Downs, a racetrack just outside the city limits straddling East Boston and the city of Revere, and the Mystic River proposal in Everett, MA. All three casinos have heavy-hitters backing them, Foxwoods in Milford; Caesars Entertainment is backing the Suffolk Downs project; and Steve Wynn behind the Mystic River proposal. All three proposals are calling for billion-dollar projects, but the main hurdle is, and will always be, the issue of passing a town referendum. In order for a project to be approved it must pass a two-thirds ballot referendum; a tall order for any measure, let alone one as polarizing as a casino. So far the only polling done was in Boston, where residents narrowly approve of the Suffolk Downs proposal.